More mandatory evacuations have been ordered in Florida counties ahead of Hurricane Michael, which has 110 mph winds and is slated to make landfall on Oct. 10. The Florida Disaster website on Oct. 9 said that parts or all of Bay County, Citrus County, Franklin County, Dixie County, Gulf County, Jackson County, Levy County, Okaloosa County, Taylor County, Wakulla County, and Walton County have mandatory evacuation orders. Escambia County, Santa Rosa County, Pasco County, Madison County, Liberty County Leon County, Hernando County, Gadsden County, and Calhoun County are under voluntary/phased evacuation orders. A list of open shelters can be accessed here. A website that shows the evacuation zones can be accessed here. Citrus County is under a Local State of Emergency and the declaration has been signed by the Citrus County Board of County Commissioners for the immediate evacuation for the following: Affected Evacuation Areas: Zone A as well as mobile homes, RVs, and manufactured housing countywide. Bay County has mandatory evacuation orders are now in place for zones A, B, and C.
Dixie County is has a mandatory evacuation of coastal, zone A, low lying areas, and mobile homes. Gulf County mandatory evacuation areas include all of Cape San Blas, all of Indian Pass, Simmons Bayou, Highland View, Windmark, Port St. Joe areas St. Joseph Bay to Long Avenue, St. Joe Beach and Beacon Hill, and Waterside of Hwy. 98. All of Jackson County is under a mandatory evacuation order. All of Franklin County is under a mandatory evacuation order. Levy County has an evacuation ordered for Coastal Levy County. All of Okaloosa County is under a mandatory evacuation order. All of Taylor County is under a mandatory evacuation order. Wakulla County has a mandatory evacuation order for “Zone A (coastal and low lying areas)and Mobile Homes and other weak structures the remainder of Wakulla County will be under a voluntary evacuation order … Citizens that are evacuating should evacuate to an area outside of the storm’s path. Neighboring counties will also be in the storm’s path and there for at risk.” The website warned there are no shelters in Wakulla County. Walton County has mandatory evacuations for Zone A and Zone B.
Santa Rosa County has voluntary evacuations for mobile home parks, campsites, low-lying areas, and Navarre Beach. Liberty County has voluntary evacuations for mobile homes, substandard housing, and low lying areas. Leon County has evacuations for mobile homes and low-lying flood-prone areas. 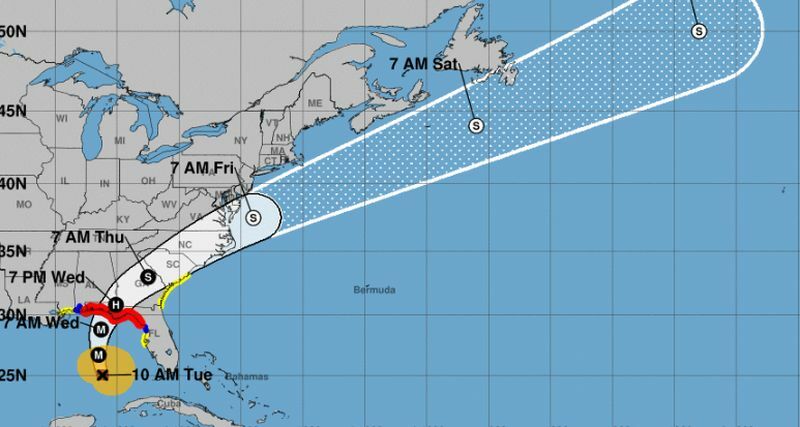 Hernando County has a voluntary evacuation order for coastal zone levels A and B for Tuesday beginning at 8 a.m.
Gadsden County has a voluntary evacuation for mobile homes and low lying areas. Hurricane Michael is continuing to strengthen, according to the U.S. National Hurricane Center’s (NHC) latest 11 a.m. update on Oct. 9. A storm surge warning is in effect for Okaloosa/Walton County Line in Florida to Anclote River in Florida. A storm surge watch is in effect for Anclote River in Florida to Anna Maria Island in Florida, including Tampa Bay. From Indian Pass, Florida, to Cedar Key, Florida, 8 to 12 feet of storm surge could inundate some areas, the agency warned. From Cedar Key to Crystal River, Florida, 6 to 8 feet of storm surge is forecast. From the Okaloosa/Walton County Line, Florida, to Indian Pass, 6 to 9 feet of storm surge could hit. Other places along the Panhandle could see several feet of storm surge. A hurricane warning is in effect for Alabama/Florida border to Suwannee River in Florida. A hurricane watch for the coast of Alabama was discontinued in the 11 a.m. update.